Collision between a ro-ro passenger ferry and a motor cruiser in the Thorn Channel, Southampton. 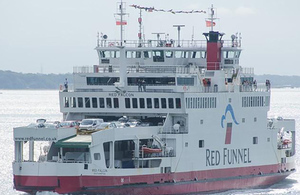 Our report into the collision between the passenger ferry Red Falcon and the motor cruiser Phoenix while heading for Cowes, Isle of Wight on 29 September 2018, is now published. The report contains details of what happened and the subsequent actions taken: read more.